A long time ago, the Earth died. Then, a man known as Y was able to use his skills with clock parts to rebuild the entire world using nothing but gears. Cities were built inside gigantic cogs, each city having a large spoke sticking out called a “Central Tower” which controlled the climate. The Earth itself went around a gigantic spring that ran around the equator to generate power. A thousand years later, this is the society that humanity lives in, with the Earth now known as “Clockwork Planet”. Naoto Miara is a student living in the Giro Kyoto. He is also a machine otaku, with his only passion in life being technology, which as a result sees him being bullied by everyone else at school. On returning to his flat, suddenly a crate drops out of a plane and crashes through his roof. He opens the crate to find a coffin, inside of which is a female automaton. Naoto decides to repair the automaton before his flat collapses, which he does just by hearing which gear in the automaton is wrong. The automaton awakes, having been malfunctioning for over two centuries, and gets Naoto out of the flat before it collapses. The automaton also requests that Naoto should be her master, and he agrees. Her name is RyuZU “The One Who Follows” YourSlave, and she promises to serve Naoto with absolute submission and loyalty. RyuZU becomes a pupil at Naoto’s school and arranges things so that Naoto can carry on living comfortably, even if she is not aware of certain legal issues. For example, she is unaware that is inappropriate for someone as young as Naoto to stay in a love hotel. They later move into the city’s best hotel. However, there are bigger problems to deal with. Giro Kyoto appears to be suffering from a “gravity glitch”. Those within the top of society know that in 42 hours the gear upon which the city lies will collapse, killing everyone living on it, and no order has been given to evacuate the area. The job of solving the problem has been given to Dr. Marie Bell Breguet, the youngest person ever to be made a “meister”, part of a non-profit guild dedicated to keeping the clockwork going. She is also a member of one of the five great corporate families of the world, is accompanied by a bodyguard and mechanical soldier named Vainney Halter, and is willing to go to extreme lengths to solve problems – like threatening people with syringes full of mercury. Breguet and Halter are also on the lookout for an automaton created by Y, who it turns out is RyuZU, and they later meet each other at the hotel RyuZU and Naoto are staying at. This encounter results in an event described at the end of the book’s first chapter. Namely, that in one month’s time, all four will be together in Akihabara – having now become history’s most infamous terrorists. Clockwork Planet already has plenty of things that make it worthy of reading. For starters there are the people behind it, with the most recognisable name being Japanese-Brazilian co-author Yuu Kamiya, who is also the creator of popular gaming fantasy series No Game No Life. It is certainly a fun series and there is plenty of excitement to be had in this work as well. Another part of this manga that makes it engaging is the setting. At first it feels like steampunk because of all the gears and the use of old technology to power the world. But on the other hand, there is no steam technology used, it’s set way into the future, and the society looks very much like our modern day one with the exception that just about every building has cogs sticking out of it. Fortunately, there is already something out there that fits this mold better than steampunk, which is the subgenre of “clockpunk”. This is akin to steampunk, but rather than being based on Victorian technology it’s based on even earlier technology like that of the Renaissance and the Baroque periods. The setting in turn results in the next element that makes this manga entertaining, which is the art. It is fun to see a world that is run by clockwork. All the cogs and gears look cool. That is why things like steampunk took off; because it looks good. For example, when Naoto is repairing RyuZU, he opens her up and you see all the delicate workings inside her. There is something beautiful about seeing all of the machinery exposed, and in the story the entire workings of the planet are out in the open, for all to see. A planet made out of this stuff looks great. While writing this review up I ended up thinking of The Hitchhiker’s Guide to the Galaxy and the planet Magrathea, which was home to a luxury business that made custom-built planets. I’m starting to fall in love with the idea of ordering a planet made out of clockwork. The way the plot is structured is also intriguing. At the end of the opening chapter it is already revealed that the main characters are going to become terrorists. We already know where the plot is going, even though Breguet and Halter haven’t even been properly introduced yet, with only their names being mentioned. However, it keeps the reader engaged. Often with a new manga you might read the first volume, but it is not enough to sustain your interest and you don’t bother to progress with the next. In Clockwork Planet the author has already fed you with what is going to come, and it sounds exciting. 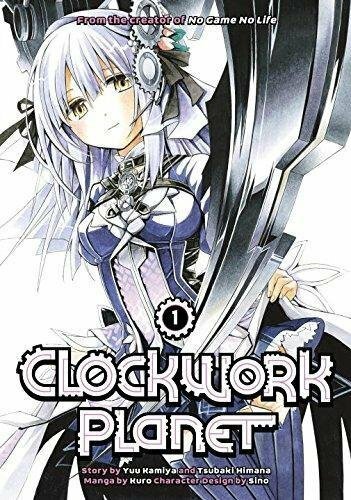 Anyway, Clockwork Planet is certainly a series I plan to continue reading and one I plan to stream if it is possible.